Our next photo special takes us back to 2002, it was around this time i purchased my first Digital Camera and really got into the Bus and Coach photography. It was an Olympus C-3000 which was an impressive 3 Million Pixels at the time! I worked in Yarmouth and my walk home after work during the summer months meant i could capture all the Coach visitors on a regular basis. First up is First Leicester Volvo B10M/Plaxton Premiere P177NAK which was working a day trip from the Midlands. It moved onto First Southampton were it ended its days as a Driver Trainer in full Barbie livery, one of only a few coaches to gain the livery. National Holidays are always regular visitors to the town and back in 2002 standard vehicles were Plaxton Bodied Volvo's, W201EAG. It went on to a brief spell with Wallace Arnold before passing to Haytons of Manchester. 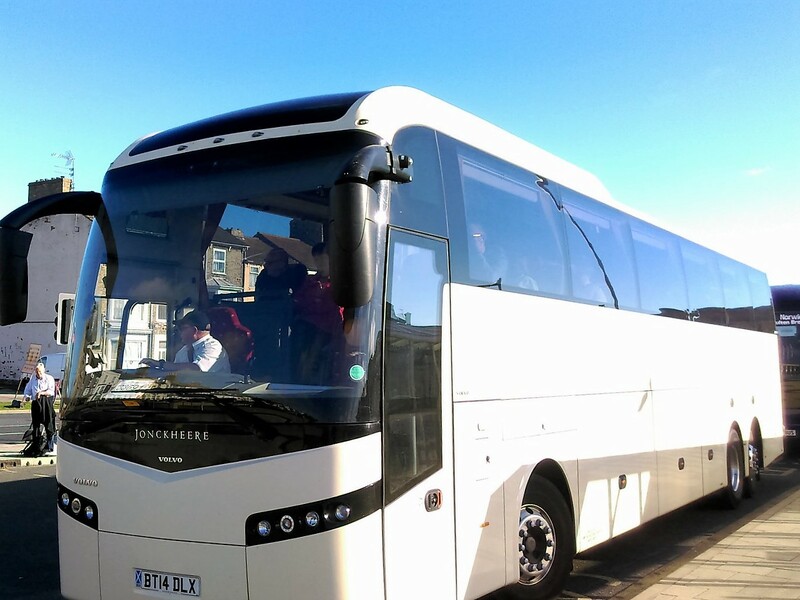 It is currently in use with J&DS Coaches of Halcrow in Shetland. 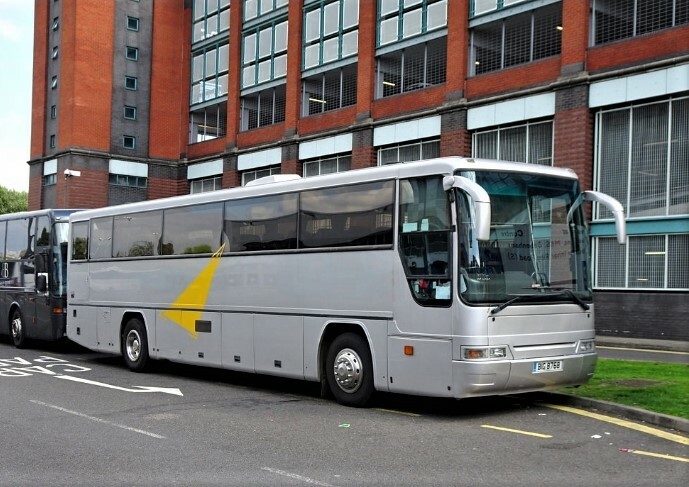 The Plaxton Paragon was a popular Coach in 2002 and Wallace Arnold invested in a large batch in 2001. Y748HWT is pictured above in front of a National Holidays coah of silmilar style. Since then Shearings and Wallace Arnold became one with National Holidays added aswell to form one large group, the Wallace Arnold name unfortunately is no more. Shearings are regularly featured on the blog and i have always photographed their fleet whenever one is in town. R909YBA Is a Van Hool Bodied Volvo. It went on to work for Fishers Tours of Dundee and was last with Mcleans of Stranraer North of the border. Finally a vehicle of local interest is P33TCC a Paxton bodied Dennis Javelin that was with Sanders of Holt, i would guess a recent aquistion at the time as it was allover White. 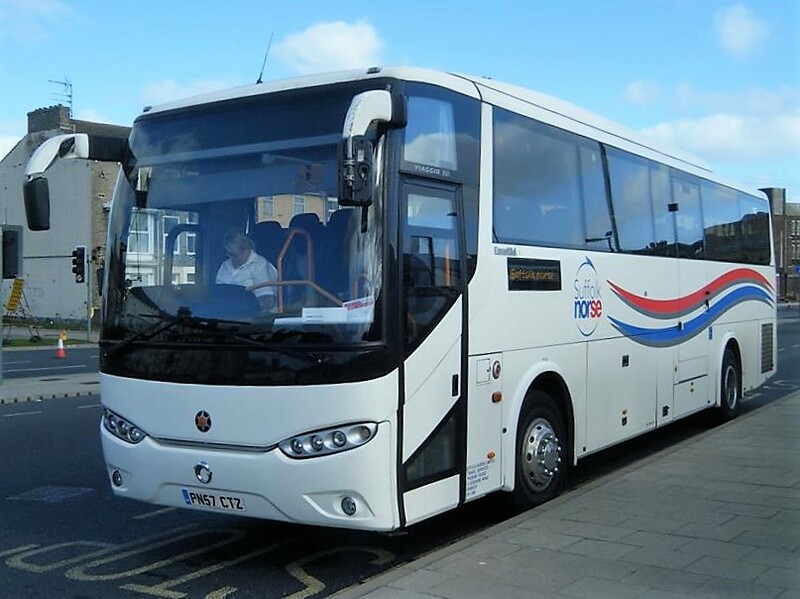 It was new to Travellers Choice Coaches of Hounslow. It did go on to gain full Sanders livery. 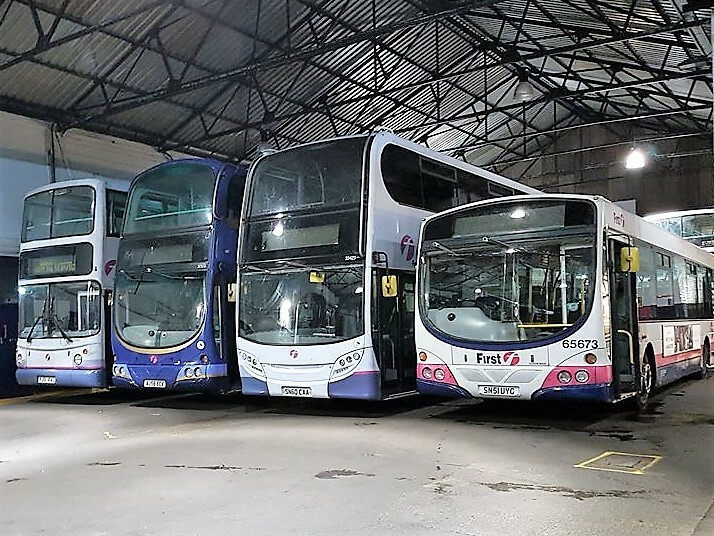 The expression 'And so to bed' was often used by Samuel Pepys at the end of his day's diary entry but in this case it refers to some of the First Eastern Counties fleet resting at the end of a day's work at their Caister Road depot. The photos were taken earlier this week by a First employee and their submission is much appreciated as we don't often have the opportunity to publish photos taken inside depots. Today it's the turn of Great Yarmouth for observations of rail replacement bus services whilst re-signalling work continues on Greater Anglia's Wherry Line. 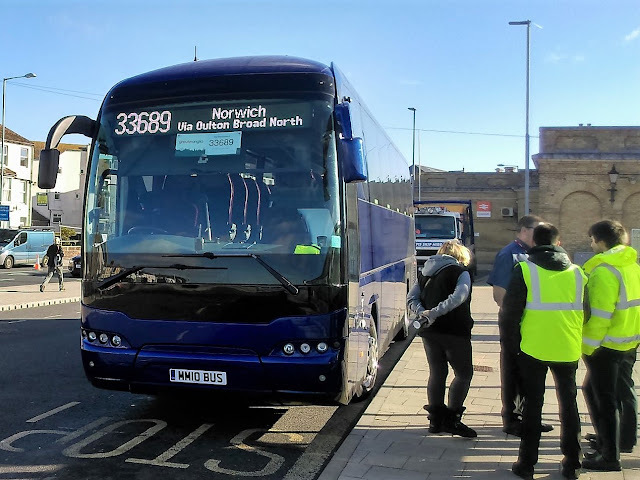 I was in position to record the departure of two Belle Coaches substituting for the 10:17 to Norwich with Volvo B10M OJI 4755 leading Mercedes Benz Tourismo BF62JZR on their journey to the city. The 10:36 departure from Norwich arrived with Sanders Coaches' Volvo B12M 3990ME in charge which was later pictured on the Asda service road behind the station. Finally, Suffolk Norse Irisbus Eurorider Marcopolo PN57CUU was employed on the 11:17 departure from Great Yarmouth Station. It was also earlier parked on the Asda service road. First up is one of Sanders two Jonckheere bodied Volvo B13RTs recently acquired from Lochs and Glens. BT14DLX was working the 10:57 Lowestoft to Norwich service at Lowestoft Station this morning. Immediately behind was Neoplan MM10BUS, operated by M&M Staffing of Cooksmill Green near Chelmsford. 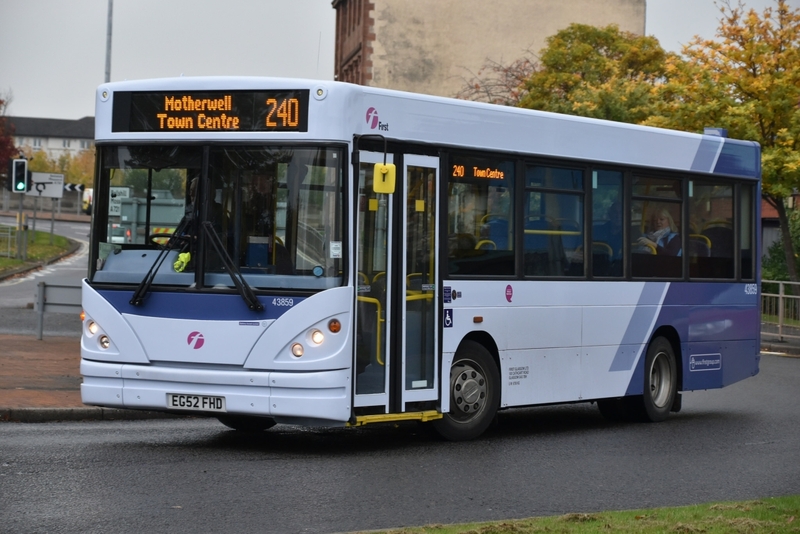 It is the first vehicle owned by this new operator and was acquired in June this year from Regal Busways. It concerns the revocation of a licence without a public Inquiry. The registered services running under the licence held by Paula Berry, Jacqueline Berry of Benacre Road in Beccles have been revoked with immediate effect. 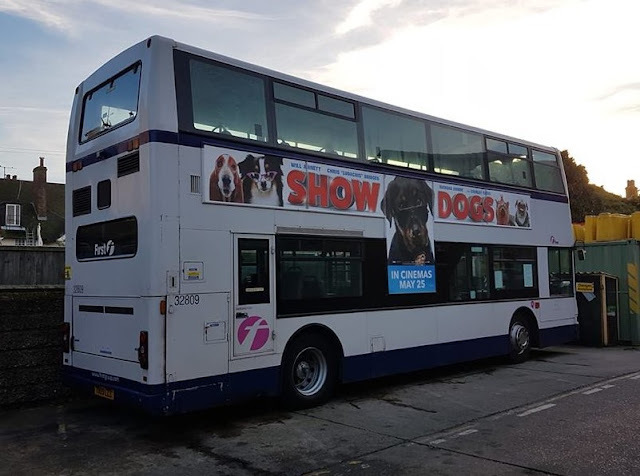 Rail services in Lowestoft have also been substituted by replacement bus services, in addition to those at Great Yarmouth, as both lines are subjected to the same re-signalling work. Our Lowestoft correspondent Simon Bartram has provided photos of replacement operations over the last few days from when work commenced on Saturday. On that day he recorded Belle Coaches' Setra LIL9715 and Smiths Coaches, Volvo L8SLT in use; with Angies Tours' MAN T777GSM on standby. On Sunday operators Belle Coaches and Simmonds were represented with MAN VRY841 of the latter being pictured at Oulton Broad North Station. 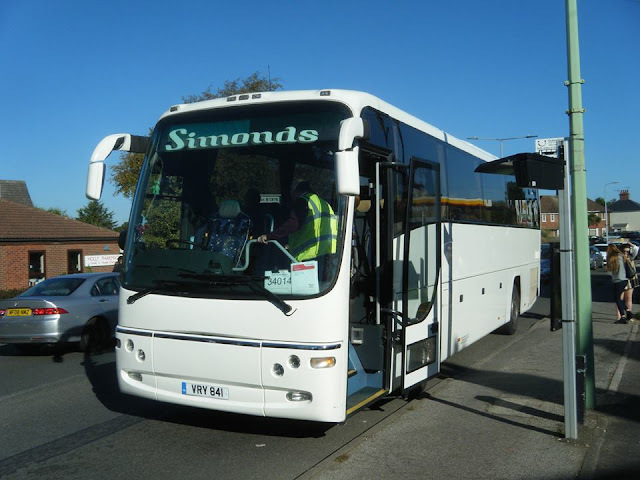 Monday saw Suffolk Norse IVECO Eurorider PN57CTZ and Coach Services YN10EDC in use. Further to Sunday's post on the arrival of the two Scania L94UBs from First Essex, Caister Road has lost no time in putting them both into revenue earning service today. 65673/7 SN51UYG/L were both observed working on the 8 James Paget Hospital to Caister route earlier this afternoon. Not only did the arrival of two First Essex Scanias provoke interest in the Great Yarmouth area yesterday but a second day of rail replacement services did so too. When I arrived at the Great Yarmouth station yesterday Angies Coaches' King Long TIG3393 was at the front of two ready to work to Norwich; the other was Freestones Coaches Kassbohrer Setra LIB3768 (apologies for the poor quality photo). I returned via Beach Coach Station where I found Coopers Tours R70JCS, a Volvo B11R/Plaxton Panther, and National Holidays Kassbohrer Setra NH11CTH. 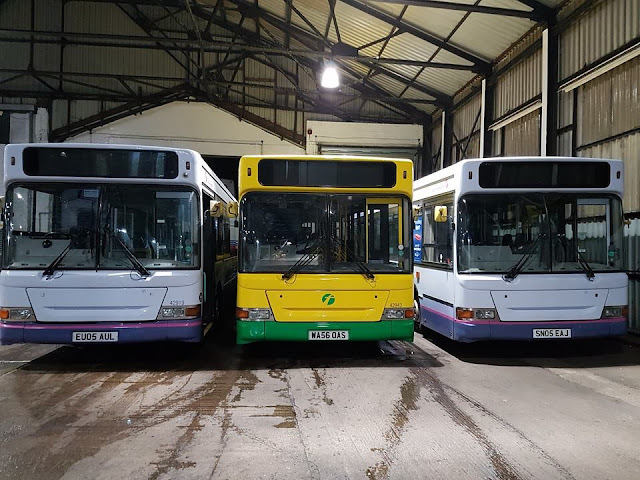 As expected, two First Essex Scanias arrived at Great Yarmouth’s Caister Road depot earlier today but they were not the two we were led to believe were coming! 65673 SN51UYG arrived instead of 65672 and the former is seen enjoying the sunshine at Caister Road around lunchtime today. However, one out of two aint that bad! Apparently 65672 broke down on Friday in Clacton and that’s why 65673 arrived instead. Two former Stagecoach Deckers have been the regulars so far this year with R562/564DRP noted in use. Both seen above in the yard in Ormesby yesterday afternoon. Wright Eclipse Urban bodied Volvo B7RLE 509 HF54HGX is seen waiting time for its 16:00 departure from Gorleston's East Norfolk Sixth Form College on Church Lane. With production activity increasing at Bernard Matthews in the lead up to Christmas, First Eastern Counties are having to provide additional buses to cope with transporting more workers. Already Caister Road has retrieved Trident 32809 T809LLC from Norwich training duties for such work. Later we found that the newcomers would be two Scania saloons from First Essex and, not only that, they were identified to be 65672/7 SN51UYE/L. 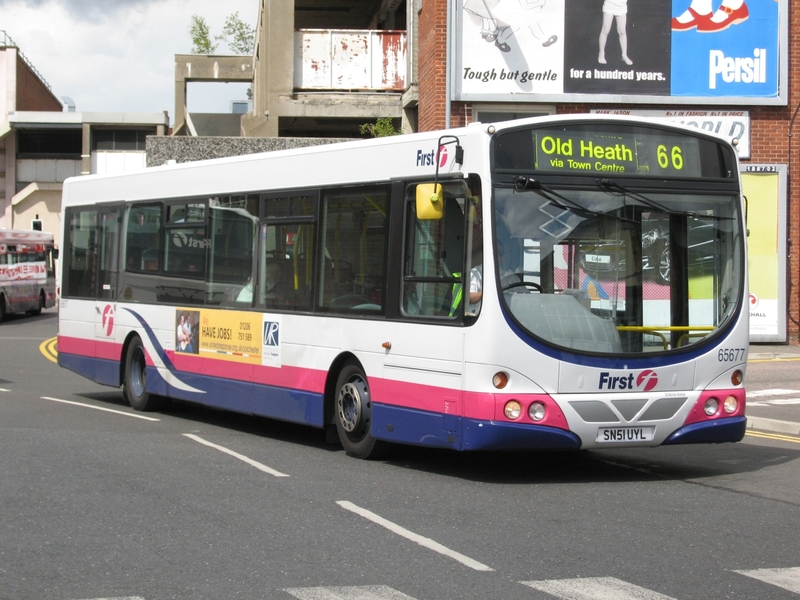 The former has been with First Eastern Counties before when based at Ipswich. They are expected to arrive in the next day or so. My thanks to Grahame for the detective work and to the contacts at First for the information. This afternoon I went for wander into Great Yarmouth and found four tourers at the town's Beach Coach Station. I hung around to see what was working the Bernard Matthews contract runs and was surprised to see three deckers from First arrive. They were Alexander ALX400 bodied Volvo B7TLs 32061 W221XBD, 32058 W218XBD and 30959 YJ51RCO. Yesterday's arrival at Caister Road, Trident 32809 T809LLC, is receiving its class 6 MOT and will also be used on Bernard Matthews duties in the near future. 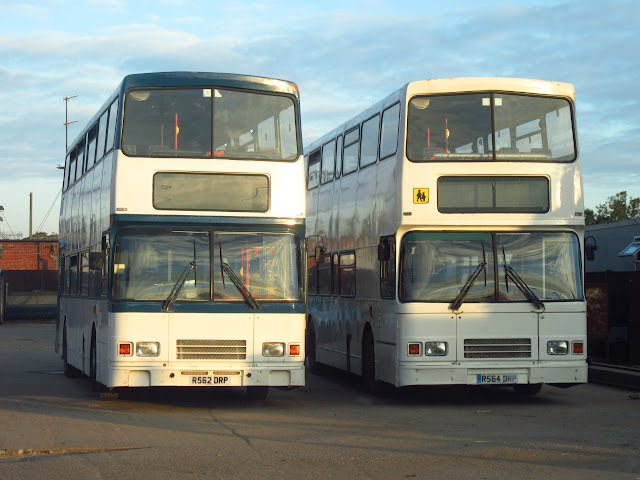 Today's Notices & Proceedings Report, published by the Eastern of England Traffic Commissioner, contains some entries affecting the local bus network. 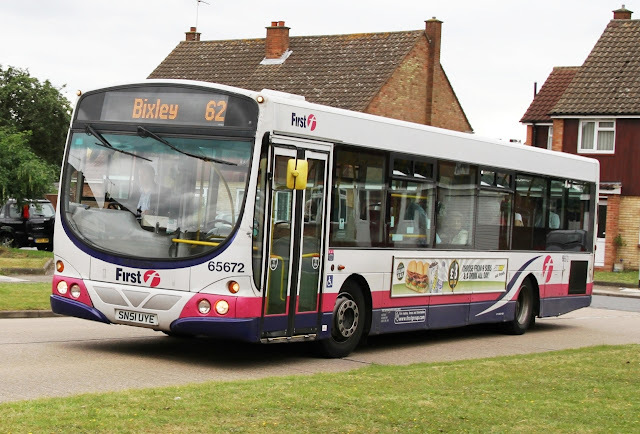 First Eastern Counties is to amend the route, timetable and stopping places of its 75,76 and 77 routes between Ipswich and Felixstowe from 18th September 2018. Also on the same day, First is to alter the timetable of its X7 service by providing more fast services operating hourly between the two towns. 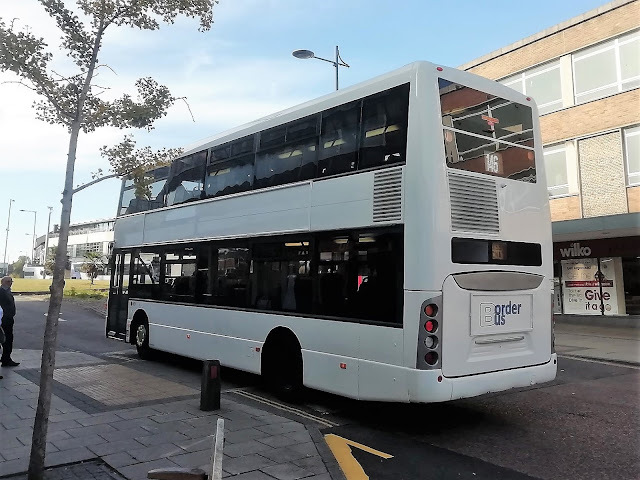 Almost six months after leaving Caister Road, former First Southampton Trident 32809 T809LLC has returned to the town from Norwich where it was in use as a driver training vehicle. The Trident is here for its annual MOT. A few observations during a visit to a gloomy Gorleston High Street during yesterday afternoon. The first is Lowestoft's Volvo B9 36215 BJ12VWX which was employed on an X11 service from Belton to Norwich. Not sure if this is unusual or not as it could be part of its day's interworking schedule with the X1 prior to returning to its home depot. The next is of Plaxton President bodied Volvo B7TL 32206 LT52WTM which has subsequently returned to service following an engine replacement. It had been off the road since June and the last I heard was that it was due to return during September. BorderBus regularly uses a decker on its 14:16 Bungay to Great Yarmouth 580 service and yesterday freshly painted Scania OmniCity 208 BB58BUS did the honours. Just the five coaches appearing at Great Yarmouth's Beach Coach Station at lunch time today. The first pairing comprised National Holidays' Mercedes Benz Tourismo NH17BFH parked beside Gee-Vee Travel's GT11GVT. The latter being a Bova Futura, a type quite common in the Gee-Vee fleet. The remaining vehicle was Chesterfield based KM Executive's VDL YD17WYY. 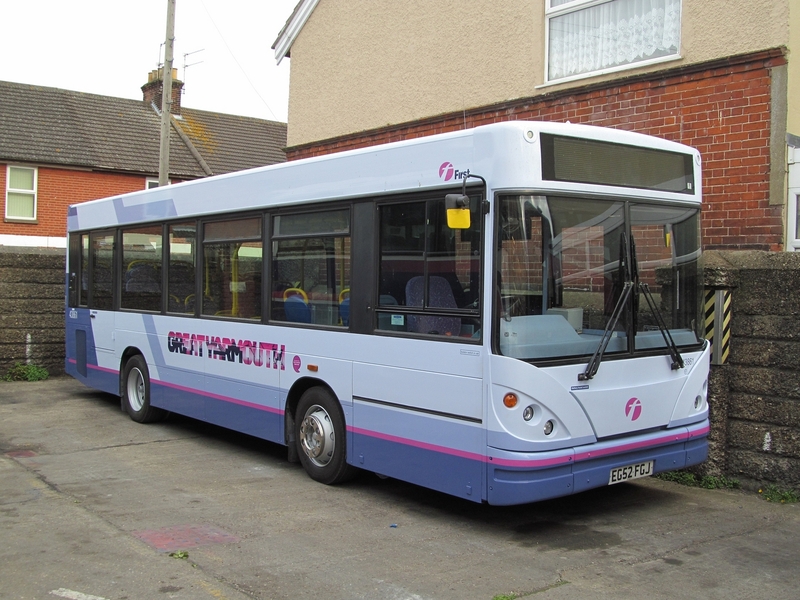 First bought a batch of Ex Connex, Jersey Caetano bodied Darts in 2013 which were split between various depots of which Great Yarmouth was one. The Darts are now well travelled after their spell with FEC. They worked at Yarmouth, Lowestoft and Norwich before being transferred elsewhere. 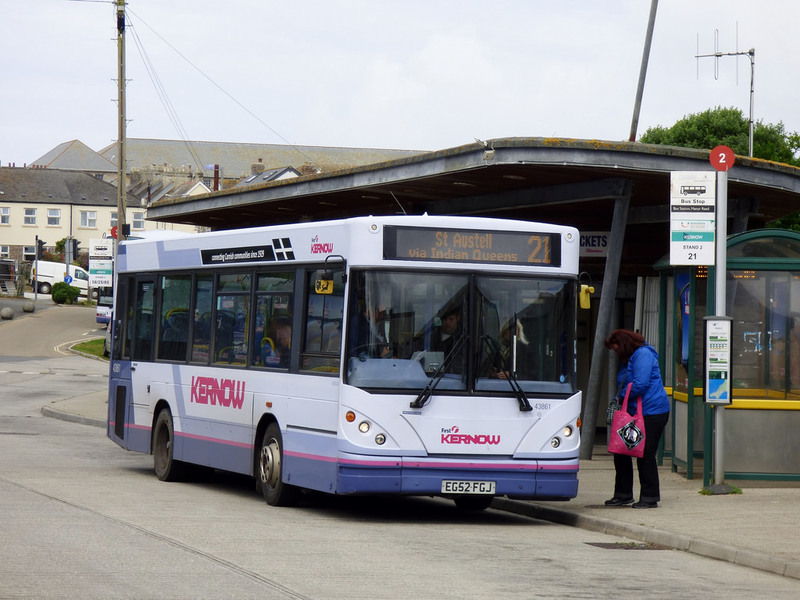 The batch were moved down to the South West to First Kernow in 2016, this included similar vehicles from Essex and Potteries. Recently the Darts have again moved on, This time up to Scotland with First Glasgow. The vehicles are being repainted into a newer version of First's corporate livery. Many thanks to Zak & David for the photographs. Whilst it's almost a fortnight ago now, I thought I would share some photos with you of my week's stay in Torbay. I was hoping to post this earlier but with the amount of photos taken and a bout of the dreaded lurgy it has been delayed until now. During almost all of last week in September we were blessed with warm sunny weather whilst being based in Torquay. The predominant operator (in case you're unaware!) was Stagecoach South West. However, not all their buses were in the usual colours as three routes had special liveries and that doesn't include the presence of Stagecoach Gold which connected the area with Totnes and Plymouth. The branded Hop12 Newton Abbot to Brixham route was worked by 67 registered Scania N250UD /ADL Enviro 400 MMCs which looked very smart in their red and white colours scheme. The Hop22, between Dawlish Warren and South Devon College was worked by green and white liveried ADL Enviro400 bodied Scania N230UDs from late 2012. 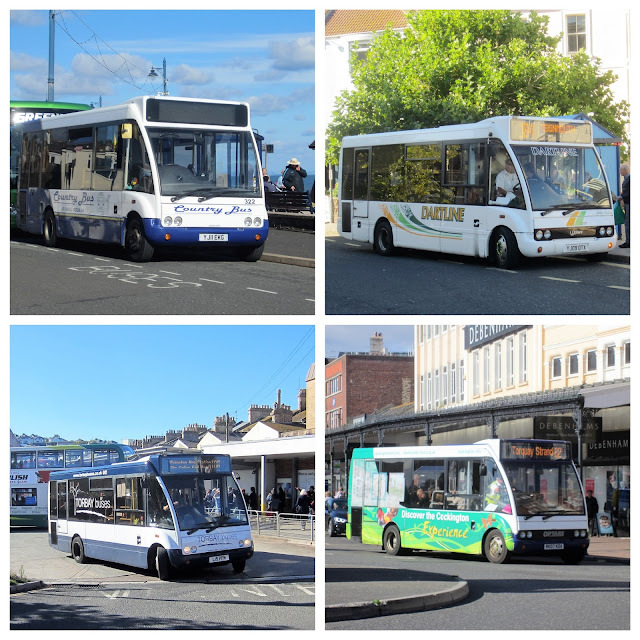 The St Marychurch to Paignton Zoo Hop122 was operated by recently converted ALX400 bodied ADL Trident open toppers in their yellow white and orange colours with each one individually named. 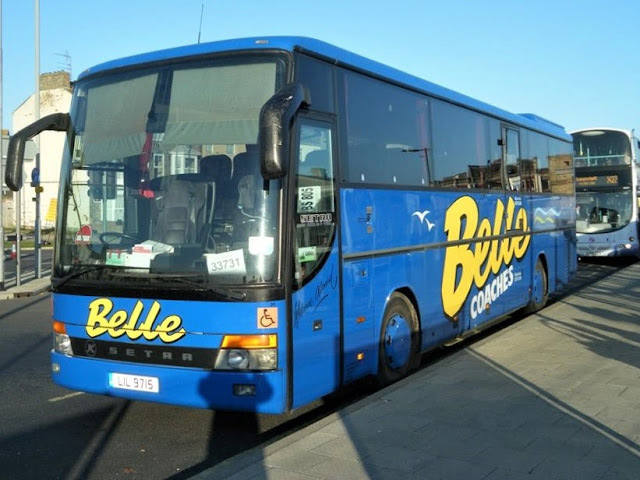 Of the short stay tourers visiting the area, the most interesting appearance was that of a Belle Coaches' Tourismo which was last week employed on rail replacement at Lowestoft Station! Omar Busboy Atiallah contacted me this morning, via messenger, to prove that he does escape the confines of the enquiry office at Norwich Bus Station now and then! 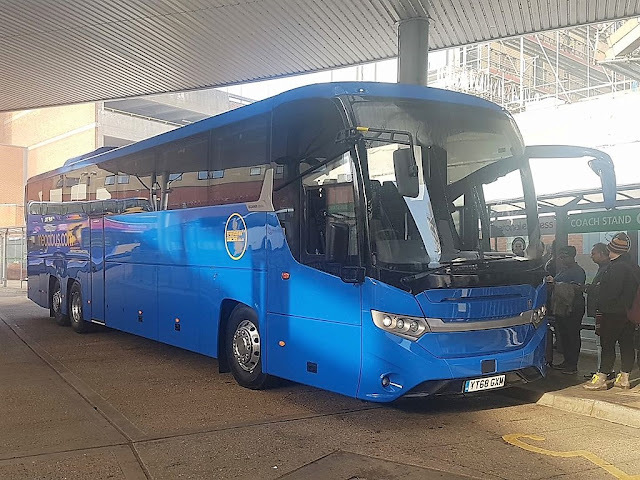 He has sent me this photo of Freestones new Scania coach at Norwich Bus Station which saw use on Megabus services during yesterday. My thanks to Omar for the photo and information. As previously reported over on the excellent Steve's Bus & Train Page, BorderBus has acquired a fifth former Stagecoach London Scania. The OmniCity, LX59CNA, was used by the operator for fuel evaluation purposes in May last year.